alaTest has collected and analyzed 1951 reviews of Sennheiser Momentum. The average rating for this product is 4.4/5, compared to an average rating of 4.2/5 for other Headphones for all reviews. Views about the price and portability are overall positive. The design and comfort also get good opinions. There are some negative comments about the size. Views are divided on the reliability. We analyzed user and expert ratings, product age and more factors. 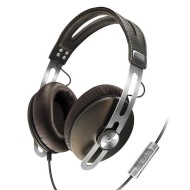 Compared to other Headphones the Sennheiser Momentum is awarded an overall alaScore™ of 90/100 = Excellent quality. It's hard for us not to love Sennheiser's Momentum on-ear headphones: they look great, sound great, and are comfortable to wear. If you're after a high-end, luxury pair of headphones then you should definitely give them a go. They're sleek and they sound great, though the high asking-price is a harsh caveat. The Sennheiser Momentum On-Ear may not fully match the larger Momentum's excellent sonics, but it gets you 80 per cent of the way there. The Sennheiser Momentum headphones may not have enough bass to satisfy every taste, but they are in every other way the best sounding, full-size audiophile headphones we've heard in a long time. 3.5mm headphone jack is not Gold plated. Sennheiser has married premium sound with jaw-dropping good looks in their new Momentum headphones.